Goldplated Nagapadam Ear studs with stone. Back is a stem with screw type. 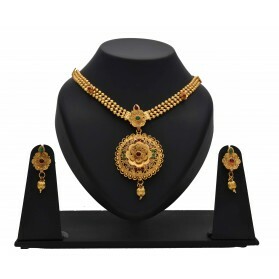 This stud is very traditional and Ethnic South Indian, Kerala Jewelry. 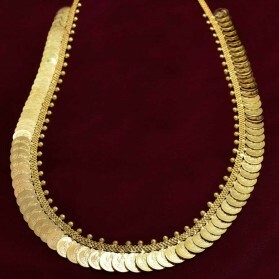 It is best with Nagapadam Necklace or Mala. Stunning gold plated White single stone Ear Studs. Screw type Back. It is suitable for teenagers and women on any occasion. Premium Gold Plated Ruby Emerald Small Sun Ear Studs. Cute High-quality Gold Plated Semi-Precious ruby emerald Stones Ear Studs for women. Complete your outfit with these elegantly designed trendy cute floral ear studs. This daily or party wear ear jewellery is a perfect gift for any age women. Stunning One gram Gold Plated American Diamond Bell Shape Jhumka with hook model Flower studs. The front portion of the jhumka has White american diamond stones. Inside the jhumka there is a White Pearl hanging. Pair this stylish Jhumkas with any Modern or traditional wear for Party or Wedding. Elegant small traditional Jhumka earring design with Ruby stone are simply exquisite, and they go well with any wear. Screw type back. This jhumkas will adore any age women. Pair this stylish Jhumkas with any Modern or traditional wear for Party or Wedding. Beautiful dainty One gram Gold Ruby and Emerald Indian traditional Jhumka earrings with tear drop dangler. Perfect for any age women for casual or party wear. Stunning One gram gold plated American Diamond Emerald Ear Drops. Screw type Back. It is suitable for Kids as well as teenagers on any occasion. Very big flower shaped one gram Gold Green Nagapadam Ear Studs. Back is a stem with screw type. 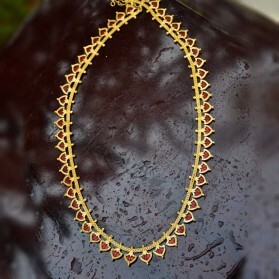 These studs are very traditional and Ethnic South Indian, Kerala Jewelry. 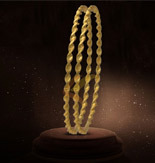 It is best for women on traditional or marriage occasion with Nagapadam Necklace or Mala. One gram gold Mango Ear studs with stone and golden beads. Back is a stem with screw type. These studs are very traditional and Ethnic South Indian, Kerala Jewelry. It is the best match for Mango Necklace or Manga Mala. One gram gold blue/green round palakka model enamel stone ear studs with Ruby/AD stones. Back is a stem with screw type. 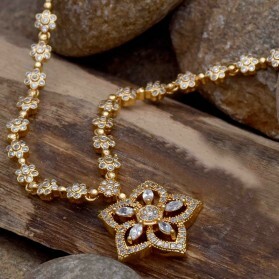 These studs are very traditional and ethnic South Indian, Kerala Jewelry. 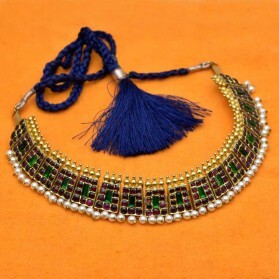 It is best with Palakka Necklace or Mala. Add this piece to your look for this wedding / festive season to match.